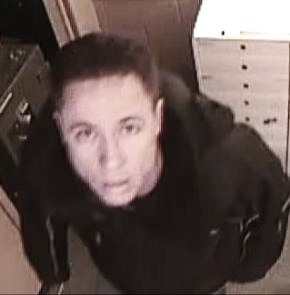 The Aylmer Police Service is currently investigating a Theft that occurred on the 30th of November 2014 at 12:30pm. This offence took place at the I.D.A. Drug Store on Talbot Street East in Aylmer. The suspect was captured on video going into an administrative area at the rear of the store and accessing a safe where he stole a large amount in cash. He did not disguise himself and can be seen looking at the camera. This occurred during business hours. The male is described as 5’10”, late 20’s-early 30’s, med build, short dark hair, shaved at the sides with a possible pencil moustache. He was wearing a dark nylon parka with a hood and lighter piping on the sleeves.